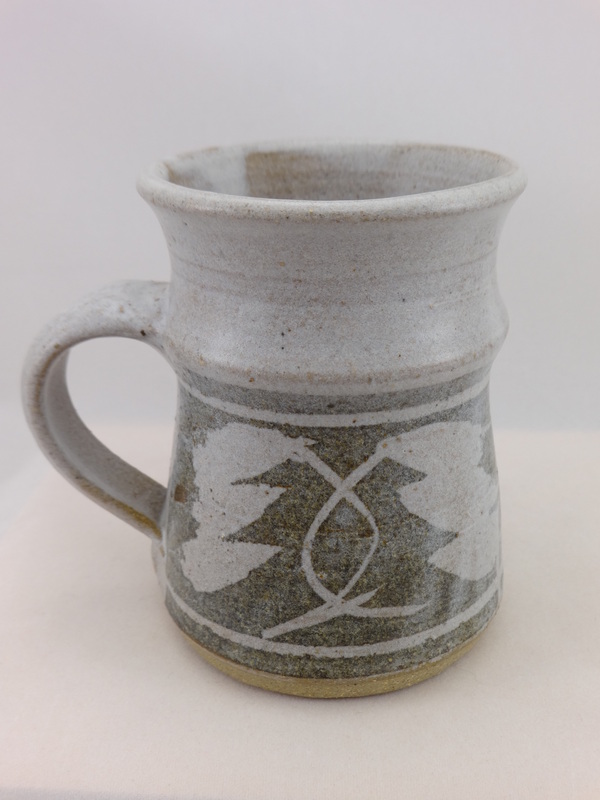 One of the first pieces of studio pottery I ever picked up — and which I still own — is this simple stoneware coffee mug by B.C. potter Robin Hopper (1939 – ). It still feels like a splash of cold water in the face when I hold it or look at it. How could I have failed to pay attention to this most common of objects? Hopper calls the mug “a very intimate pot”. We use them daily, our hands form as close a relationship with them as a handshake and of course they encompass a range of drinking activities — celebratory as well as somber. One of the many things that Hopper is known for (he’s the author of several acclaimed books and videos) is his insistence on right proportions and ratio. His small mug gets it perfectly correct from the placement of the handle attachments; to the Golden Mean balance between the upper and lower elements; to the width of the mouth and the thin base of exposed stoneware. In small things details count for a lot, even this oatmeal colour base is slightly canted, echoing the pulled out shoulder and mouth. Beautiful to hold: comfortably sized, heat holding, contrasting feel to stoneware and glaze with a surprising range of grip holds. And lastly, how expertly the subdued glazing in motif and technique performs, pulling the mug together as a completed form. You can find more about Robin Hopper through his website and the Bronfman Collection in Ottawa.